From the abundance of California restaurant reviews on this blog over the last month or so you may have realised that I’ve just got back from a little trip Stateside. As you can tell from my reviews I found some great places to eat and enjoyed lots of lovely food, but as lovely as it was sampling the delights of the America’s West Coast, I am so happy to be back in my own kitchen cooking and baking again! I’ve had a slightly crazy work schedule since I’ve been home so I’m a little slow on the uptake of developing some tasty new recipes for you all but I did manage to quickly throw together these tasty treats at the weekend. 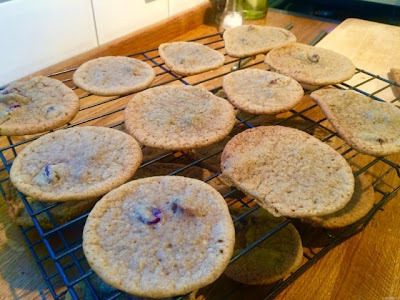 This recipe just goes to show how adaptable baking can be, once you’ve got the basic ratios of flour to egg to sugar etc right in a recipe you can swap out all the ingredients to make a huge variety of different things. 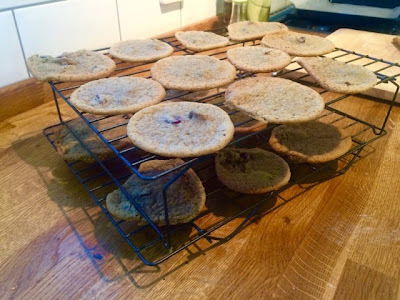 For these cookies I use the same basic recipe as my Chewy Chocolate Chip Cookies and my White Chocolate & Macadamia Nut Cookies, but for each recipe I just swap around the different types of flour and sugar and switch up the fillings and flavourings. This time I wanted to make something a bit seasonal and in keeping with the approaching winter months so I went for fruit and spices. The spices, plus the dried cranberries also happened to be what was available in my kitchen cupboards without me having to make a trip to the shops. These went down very well in the office on Monday morning! 3. 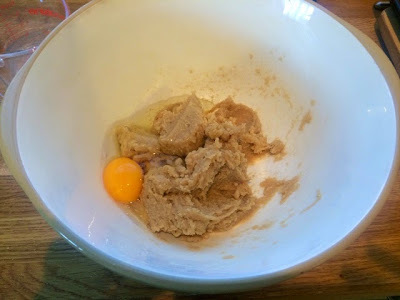 Add the egg and beat in until you get quite a liquid consistency. 4. 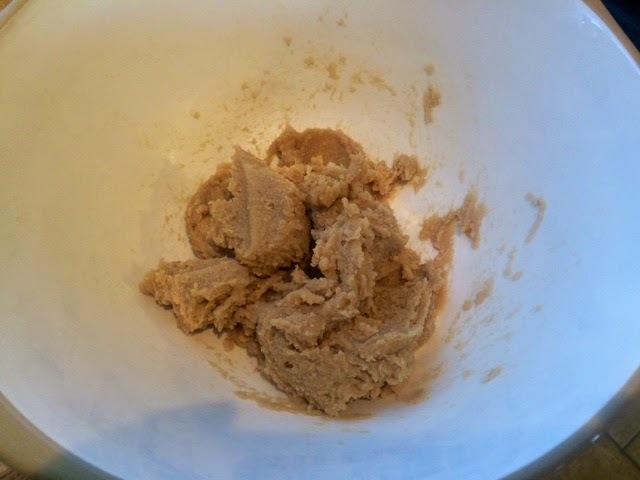 Add the baking powder, bicarbonate of soda, salt and spices before sifting in the flour. Fold everything in until you get quite a pillow dough. 5. Fold in the cranberries until they’re spread evenly throughout. 6. 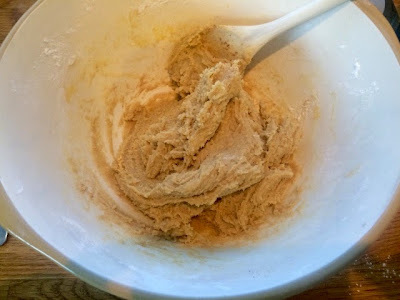 Scoop out two teaspoons worth of dough and gently roll into a ball between your palms. 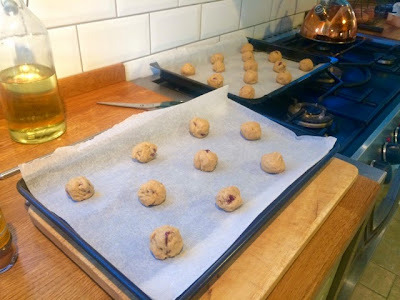 Space evenly and far apart on your greaseproof paper lined baking tray. 7. Bake for 10-12 minutes or until lightly golden but still a bit squidgy looking. Do it in batches if you don’t have enough oven space. It’s better to do this rather than squeeze them all onto one tray as they will spread in the oven. Even though mine were quite spaced out you can see I have a few oddly shaped ones where they did spread into each other a bit in the oven. 8. Leave to cool on a wire rack, in the meantime put the kettle on and have a cup of tea ready for dunking when they’re cool enough to eat.